Dhafir Smith's record looks bad on paper. 26-23-7 with 4 KOs. It is the record of a typical club fighter, a road warrior who has taken just about every fight that has come his way, no matter who it was against or where it was fought. Maybe that's why they call him "No Fear". But Dhafir Smith refuses to let that bumpy road of a record define him. "I feel as though I am a Rocky story, Smith said. "Don't judge the record, judge the fighter, and I'm a hell of a fighter." Smith has travelled the country facing rising boxers in their back yards, and he feels that he has experienced more than his fair share of unfair decisions. "A lot of my losses... I've been robbed," Smith said. "I got robbed in my last fight (a 10-round unanimous points loss to Umberto Savigne, whom Smith decked in round three). I have 26 wins on paper, but really I have 33 wins. You count all them draws, they're all wins. So it should really be 33 wins at least." It's been a long road for the 30-year old Smith. He started fighting as a kid, but appears to be nowhere near the end of his career. 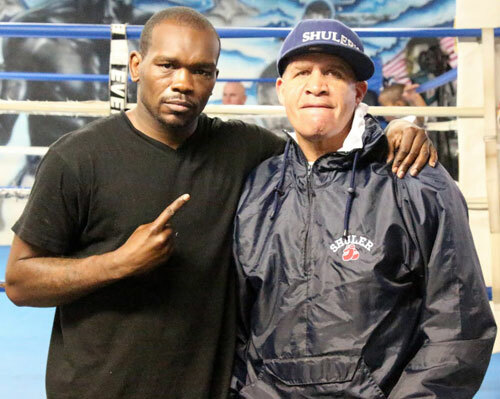 He won the Pennsylvania State Light Heavyweight Title last May with a unanimous decision over Tony Ferrante at Harrah's in Chester, PA. Smith returns to that venue for his first defense, a 10-rounder against Anthony Caputo Smith, 13-1, 10 KOs, on April 19th. "I started when I was 12 years old," Dhafir said. "Where I was from, I needed to learn how to fight. My Grandma said that I needed to learn how to fight. I came in here (West Philly's James Shuler Memorial Boxing Gym), and tried it out for a couple of months. Once I started getting in the ring and boxing, I just liked it. From there I just said I'm going to keep doing it." So Smith embarked on an amateur career in the rugged Philadelphia boxing system. "I had about 52 amateur fights," Smith said. "I had about 32 wins, something like that. I won the Golden Gloves, the Silver Gloves, that kind of stuff." 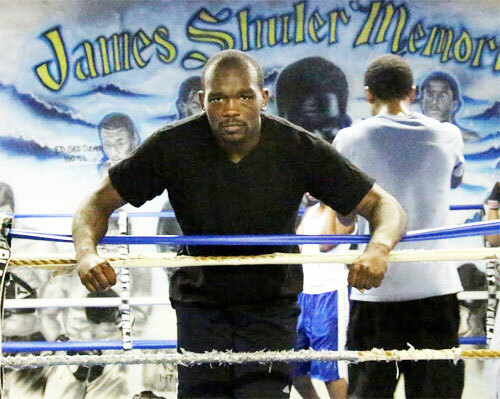 Smith came up at the Shuler Gym, and worked with numerous local boxing talents. "There were a lot of good fighters that I learned from and put into my own style," Smith said of the long, hard days at the gym. "Bernard Hopkins, Charles Brewer, a lot of fighters." Smith turned professional in 2001 and won eight straight fights. After three years in the ring, Smith was sitting on a solid 12-4-2 (3 KOs) record, but then that's when things started to get interesting. Smith hit the road and started hitting those bumps. In the next three years, Smith went just 4-11-2, facing nine undefeated fighters and appearing 14 times on the road, including in Poland and Russia, during the stretch. Smith began 2007 with a 16-15-4 (3 KOs) overall record, and the pattern continued. For the most part, when Dhafir fought at home he won, but when on the road, the "W" usually went the other way. When a fighter starts logging so many losses, his dreams begin to change. Those old thoughts of shooting up the world rankings and closing in on a championship start to tatter and get further and further out of reach. Some fighters just give up and become the opponent, rarely winning again, and never again dreaming of a world title. However, Dhafir didn't give in to his bad record. He kept fighting, accepting whatever fights he could get, stayed out on the road, and continued to believe in his own talents. Smith's record remained in the .500 ballpark, but a he hit a few positive milestones that helped keep his championship dream alive. In 2010, Smith scored a huge victory on the road, when he soundly defeated former champion Jeff Lacy in his hometown of St. Petersburg, Florida. No one expected Smith to win, but he did. It was a typical Dhafir road trip - a favored opponent, hostile environment and low expectations - except for one critical difference. The result. Smith flipped his usual script, and won the 12-round fight by unanimous decision. The fight changed things for Smith and breathed new life into his old dream. The victory over Lacy finally gave Smith some evidence that he wasn't your run-of-the-mill club fighter. All along, he felt he was better than his record suggested, but never had much proof of it for the outside world. His win over Jeff Lacy gave Smith the signature win he needed. Also around this time, Smith started getting offers from major boxing stars who wanted to use Dhafir as a sparring partner. These well-paying jobs became a new source of revenue for the Philadelphian, and allowed Smith to test himself against some of the top fighters in the world. "Andre Ward, Lucien Bute, Adonis Stevenson, Zsolt Erdei, Edwin Rodriguez, Brian Vera, and Triple G (Gennady Golovkin)," Smith listed. "I always come out there and give them good work. I give them great work. I give them what they need. I give them what they ask for. Every camp I've been in, I give them what they ask for. My job now is going to camps. I'll probably be going to training camp with Mikkel Kessler for the Carl Froch fight. If not that one, I might be going to Sakio Bika's camp. He's got a fight coming up. I might be going to camp with Chavez Jr. There's a couple of big camps coming up that I'm already looking to be picked for." However what Smith really longs for is to get an offer to actually fight one of these big names. "It's going to come," Smith said. "It's going to come. I was talking to Brother Naazim (Richardson) yesterday. He said that I'm still going to get those chances because people know that I'm a hell of a fighter, and I beat some good fighters already. I'm still here, and I can still beat these guys at the top level, if they just give me a chance. I'm just hoping they give me a chance." It would be great to see him actually get such an opportunity, but Smith is one of those guys who may just be more trouble than he's worth. His record isn't one that TV networks would ever consider, and the big fighters don't see any upside to beating him. Therefore they would never risk the downside. So such a call may never come. "A lot of promoters, a lot of matchmakers, booking agents, they know that I'm a hell of a fighter," Smith said. "That's why they don't want to put their guys in there with me. Because they know I can beat them." Until that elusive offer comes, Smith continues to plug along, and his fight with Anthony Caputo Smith for the PA State title is next on his agenda. "I'm happy about it," Dhafir said. "I love fighting at home, because I know that I'm going to get a fair decision. It feels good to defend my state title. Going down in history, defending my state title, and defending it well. I love being the main event. I love showing people that I can step up to the plate and be the main event for a big card like this. There's going to be a lot of good fights on this card." The fight with Caputo Smith has been brewing for a while now. As far back as one year, there was talk of matching these two. Promoter Joey Eye finally got it done, but not while Caputo was still undefeated. The Delaware fighter known as "The Bull" lost his last fight by TKO to Kevin Engle last August. Dhafir wanted to be the first to beat Caputo Smith. "That was the first time I seen him fight, when he got knocked out," Smith said. "I feel a little bit disappointed, but he's a tough fighter. He's 13-1 with 10 knockouts. That's a pretty good record. I give him all the respect in the world. I know it's going to be a good fight. He's going to come to fight, and I plan on putting on a hell of a show." Smith knows that while he's home, he has to perform well and make a statement. He's also looking to up his game. Fans familiar with Smith's crafty, careful, and jab-centric performances may be in for a surprise on the 19th. "I plan on putting on more pressure," Smith said. "Throwing more punches. Putting more combinations together. I really want to knock this guy out. I really want to prove a point. When I fought Ferrante and hurt him in one of those rounds, I didn't step on the gas. I think I hurt him in the 8th, 9th round, and I just didn't step on the gas. That's what I need to start doing. Like in the last fight (Umberto Savigne), I dropped the guy. He was hurt and everything. I was beating him every round after that, and I hurt him a couple times. I just gotta learn how to step on the gas a little more." A new and improved, more aggressive Smith may land more fights, and he believes that if he hangs in there long enough his time will finally come. "I'm just ready to fight on the 19th," Smith said. "I'm ready to put on a show and looking for some bigger and better things after this. We're going to see what happens from there. Hopefully I can get a shot at a major title that can get me in the top 15 in the world rankings." 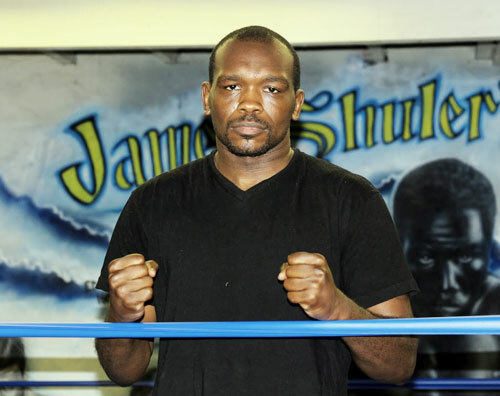 Smith looks to former champion Freddie Pendleton as his role model. The Philly-born Pendleton, the patron saint of late bloomers, finally won the IBF lightweight title in 1993 after a long career, and with a lumpy record of 32-17-4. Since then, Pendleton's story has provided hope to every fighter in Smith's position. "A lot of people call me the Freddie Pendleton of this era," Smith said. "There are a few other guys out there that got the type of record that I got, but they don't beat guys like I beat. I done beat some name guys. Former world title challengers, former contenders, and former world champions that I'm beating. With my type of record, you can't judge the record. You have to judge the fighter. This is my 57th fight. I got more fights than anybody in Philly except Bernard Hopkins." It's been a long, long road for Smith, and there have been a lot of disappointments along the way. Chances are good that there will be more disappointments to come. But Dhafir Smith isn't discouraged. "My story is different," Smith said. "I'm going to get my shot. My chance is going to come. I just got to keep on winning. When fights like this come, I got to keep beating these guys that I should be able to beat with no problem, and just move on and get a bigger and better name. I just feel as though I'm a Rocky story in real life. You don't fight the fighter's record, you fight the fighter. I'm a hell of a fighter, and a lot of people know that." Everyone will know that, if Dhafir Smith can follow in Freddie Pendleton's footsteps and make his own Rocky story come true.